One thing about writing a story about an anthropologist is that you have to know something about anthropology. I haven’t studied anthropology since my younger days in college, but while I was scrambling to remember key traits, I came across an anthropologist who, for the most part, saved my character and my state of mind. 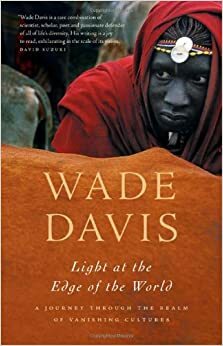 Wade Davis is an anthropologist, ethnobotanist, author, and photographer who has focused primarily on worldwide indigenous cultures, especially in North and South America. He’s Professor of Anthropology and the BC Leadership Chair in Cultures and Ecosystems at Risk of the University of British Columbia; has published popular articles in Outside, National Geographic, and Fortune; and is Explorer-in-Residence at the National Geographic Society, which has named him one of the “Explorers for the Millennium.” Most would know him from his best-selling book The Serpent and the Rainbow which was about the zombies of Haiti. So as you can see, Dr. Davis knows what he’s talking about (and to be honest, I’m not sure if he really goes by as Dr. Davis since everything with his name on it just says Wade Davis or Davis; but to be respectful, and until he personally corrects me, I’m calling him Dr. Davis). I’ve bought three of his books, and so far the one I’ve finished is Light at the Edge of the World. He gives an amazing glimpse into cultures that are fading, showing how the modern age is eliminating cultures while taking small steps to retract the damage. He hits on tribal cultures in Africa, the Arctic, and the Amazon, and although I mainly bought the book for the section regarding the Amazon, I ended up reading the entire book. Not only is he a compelling writer, but his journeys alone are fascinating. In fact, he makes me want to go out and meet these people he talked to, seeing the world through their eyes. That was the mindset I had had when I was younger and first taking anthropology, so it felt rather nostalgic reading his book and having that feeling to explore the world come back to me. His travels and research helped remind me of the passion and drive that a person in this field would have. Although my character needed a dose of realism, I also read Dr. Davis’ book in order to get a better understanding of not only how some cultures fade but also how their extinction can affect the world. Not only was his writing awe-inspiring, but it made our reality a little darker: languages, as we speak, are disappearing; traditions are being exterminated; and histories are being forgotten. This fate is something that my fictional tribe is eventually confronted with, and it was Dr. Davis’ book that gave me a reality check, showing me whole new worlds that are collapsing right before our eyes. I highly recommend not only Light at the Edge of the World but any other of Dr. Davis’ books. He’ll sincerely open your mind and give you your own adventure streak that you never knew you had. If you’d like to check it out, click here. Why it may deter you: Anthropology is a very broad field, and although Dr. Davis became a huge inspiration as an anthropologist for my character, I didn’t follow his philosophies verbatim. My story is a historical drama, so a lot of the issues that Mr. Davis points out are issues that didn’t really exist or weren’t as extreme back in the 1930s. They are pointed out later in the story, but are not the primary focus. I always feel sorry when I think that there are languages dying out, and cultures fading and histories lost forever. But I also think that it has always been like this. Cultures, like all living things, have an arc. They come to life, live, evolve and die. I know we’d like to preserve everything, but this is not how nature has disposed. I think sometimes we shoudl be more humble.